We’d love your help. Let us know what’s wrong with this preview of McGrave's Hotel by Steve Bryant. Assistance with locating a missing and priceless mummy, wrangling mutant spiders, and attac It’s 1936, and nearly twelve-year-old JAMES ELLIOTT is a bellhop at McGrave’s Hotel, there a year since the night his parents died while on a spy mission into Nazi Germany. To ask other readers questions about McGrave's Hotel, please sign up. Fun read for middle graders who like a mysterious, slightly scary story. Story: The story was pretty bad. I don’t want to say that, but, to be honest, I don’t even know what the overall story was. There was too much going on and it didn’t make much sense what the main story was supposed to be. I wasn’t sure if we were following James to learn about his parents or if we were supposed to see a relationship develop. The story was a mess, though I did like the quick pacing as it made it an easier read. Characters: The characters weren’t interesting. They were flat and didn’t develop. The only interesting character with a seemingly intriguing back story was Death. The main character, who was supposed to be quite young (eleven) acted like he was much older, and he hardly had any personality and no development by the end. World-Building: The world was the best part of the book. Even though it was lacking in areas and could have used a lot more development, the author clearly did research for the time period. I liked the details of the environment and clothing that the people would be wearing, and it really placed the reader back in that time period. Editing/Presentation: The cover is definitely eye-catching, with a nice coloring and angle. It’s what caught my eye in the first place to read the book. However, this could have used probably five more edits, as it wasn’t ready for publication. There were too many run-on sentences and the formatting was a bit off. I would sadly not recommend this book. It lacked development, it was confusing, and it wasn’t written too well. I don’t think I’ll be reading another one of the author’s books, either, unless if they catch my attention and are written after this one. Mr. Nash, the night manager, is very fond of James. James is very mature for his age James is a twelve year old boy. His parents were spies and they died on a mission. Since the deaths of his parents James is living in McGrave's Hotel. He also works there as a bellhop. James learned early on that spies will always try to leave a message for their loved ones. It's been a year since his parents died and he hasn't received anything from them yet. He keeps hoping that somewhere someone will find it. James is almost twelve years old and lives at McGrave’s Hotel. His official job is a bellhop, but he is like part of the family at McGrave’s. The other workers tutor him in his schooling and take care of him like he’s their son. His own pare I know I’ve said it before, but I love Middle Grade books when they are well-written. McGrave’s Hotel is one of those books! 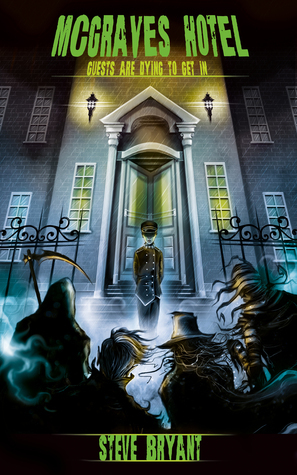 It is so much fun, and your middle grade reader (and you) will love all of the quirky, spooky characters that stay at McGrave’s Hotel. The interesting thing about this story is that it’s actually not one mystery; there are technically three major ones to be solved throughout the book, as well as a minor conundrum or two. A great read for young adults with plenty of entertaining characters, a hotel that is more than it seems for the location, and stories to enjoy.